The history of The Fulton Railroad Company, Ltd. and Cincinnati Barge & Rail Terminal, LLC offers a fascinating look at Cincinnati’s backstory as the country’s first Western boom town. This is the 2nd chapter of a 4 chapter story of the site’s many uses to the community and in domestic and international trade. This series premiered in The East End Newsletter in early 2013. Sketch of 1861 Civil War Fortifications atop Mt. Adams. Courtesy of Cincinnati Public Library (Cincinnati Memory Collection). Note the guns arrayed to protect the shipyards as well as the downtown. Fulton had emerged as the most important shipbuilding site on the Ohio River (and therefore the West) when it became Cincinnati’s first annexation in 1855. Cincinnati nearly tripled in population in this era from 115,000 in 1860 to 326,000 in 1900. Within the few square miles enveloping today’s CB&RT a total of 16 boatyards produced hundreds of white packet boats. Both time and tide wrought changes as 8 different streets: Weeks, Vance, Niagara, Brooklyn, Waldon, Litherbury, Fulton, and Willow were built on, became driveways or were submerged as The Army Corps of Engineers raised water levels. During this time, local manufacturers built many famous boats. Meanwhile, the Rookwood Pottery began its operations onsite and then headed for the hills. Area residents served as coopers, shoe fitters, machinists, show makers, lumber dealers, brick masons, box makers, river men and caulkers as the shipbuilding waned with the rise of rail. The history is so rich that it reads like a version of Atlantis as told by Mark Twain. 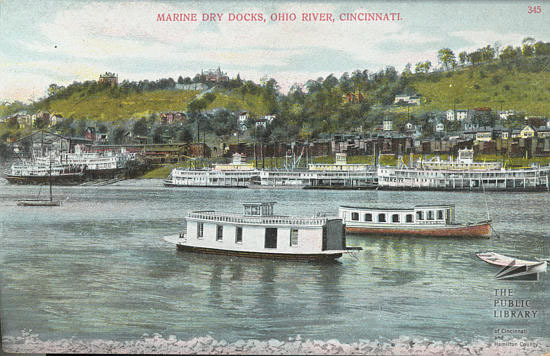 Marine Dry Docks Postcard. Courtesy of Cincinnati Public Library (Postcard Collection). Other businesses in the area included A. Macdonald and Company who operated a cooperage on the riverfront. Cattle sheds and a freight house sat behind the Little Miami Railroad. The Oxley Stove Company had a private rail siding south of Niagara Street and the Worner-Rogers Manufacturing Company operated on Gladstone St. 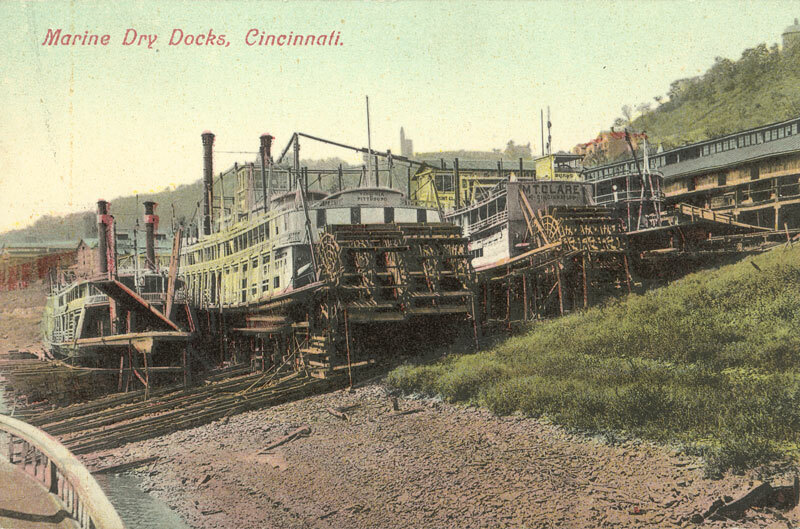 The tight integration of the waterfront businesses propelled the economy often finishing the boat from Fulton with fine interiors supplied downtown via Cincinnati’s public landing. 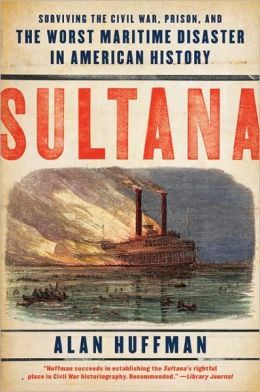 John Litherbury built the Sultana on the western side of today’s CBRT in 1863. In 1865 it went down in flames taking 1,600 Union soldiers lives in the greatest maritime accident in US history. During The Civil War, boat repair and transport of goods emerged as the primary port uses. Guns were arrayed on Mt. Adams to protect the valuable docks as seen in the illustration (at top). Among the most famous local boats was John Litherbury’s The Sultana built in 1863. It burned down two years later in the greatest maritime disaster in American history killing 1,600 freed Union prisoners attempting to return home at the end of the Civil War. In The Great Race of 1870, the Natchez (built in 1869 at Marine Railway) lost to the Robert E. Lee. Currier and Ives rendition of the Great Race of 1870. Cincinnati’s Natchez vs. The Robert E. Lee. This Natchez was the sixth in a series of boats bearing that name. 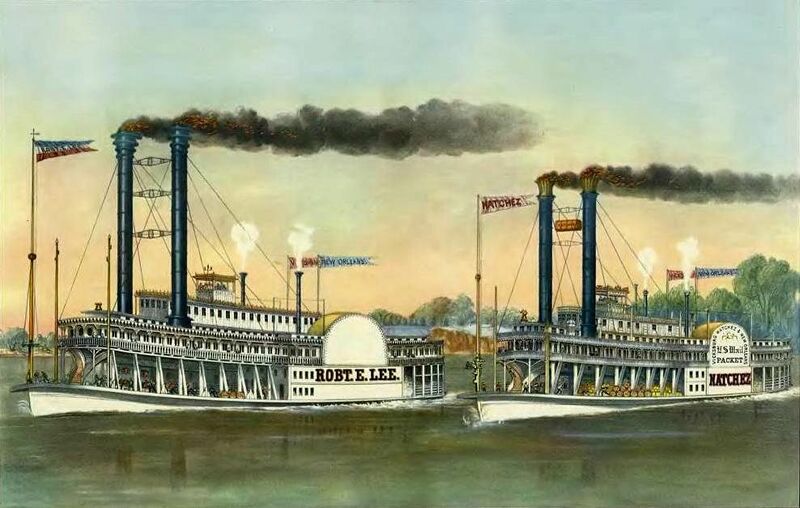 She was said to be faster than the Robert E. Lee, but had to stop during the race due to a thick fog on the river, consequently losing the contest to a stripped down rival bearing less weight. Captain Thomas P. Leathers owned and operated her. The colorful Leathers, a Southerner, never flew the American flag on vessels under his command. He was a personal friend of Jefferson Davis and transported him on the previous Natchez from his plantation to Montgomery for the swearing-in as President of the Confederacy. Leathers burned that Natchez on the Yazoo River ending a chase by Union forces in 1862. He did not want that quality hardware to fall into Union hands. The speedy 6th Natchez was dismantled in 1879 in Cincinnati. In the latter era of Marine Railway Co., David Gibson, a Scottish immigrant with prominent successes in insurance and whiskey, took on Roger’s business role. Gibson also became a commodore of steamboat lines including the Cincinnati and Pittsburgh Packet Co. His distilleries in Lawrenceburg, Indiana required a constant supply of grain, fuel, sugar and barrels supplied by his other business interests. He trained Lee R. Keck, who was an officer of the U.S. Mail Line and the Memphis and Cincinnati Packet Company. For 80 years, Cincinnati Marine Railway Company maintained its headquarters at the corner of Eastern and Brooklyn Streets. The company’s elaborate records on the costs and materials of each ship built are still in tact. It’s unique longevity due to running the crucial dry docks to repair fleets for companies jointly held by many of the same owners. The last ship built on site was the Queen City in 1897; she incorporated many features as a sort of greatest hits of what Marine Railway had to offer. She lasted longer than most steamboats, serving as a wharf boat in Pittsburgh until sinking in 1940. 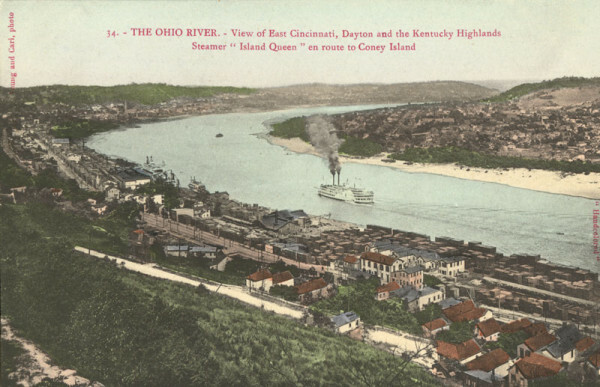 The busy Ohio in the late 19th Century. Courtesy of Cincinnati Public Library (Postcard Collection). Popular culture has long revered the steamboat. Mark Twain (his name a river boating term) chronicled the era. In Huckleberry Finn, he invoked the theme that the river, exemplified by steamboats, offered a slice of civilization amidst an unruly frontier. Their plush upholstery, fine wood finishes, chef cooked meals, spirits, and entertainment stood out. As recently as 2012, Cincinnati-born filmmaker Steven Spielberg’s Lincoln included steamboats as executive meeting spaces. In 1969, John Fogerty’s steamboat paean Proud Mary hit #2 on the pop charts for CCR inspiring 100 cover versions including the 1971 Ike & Tina rendition which returned the song to #2. Not to be left out, Walt Disney debuted his iconic Mickey Mouse as Steamboat Willie in 1928. Indubitably, Fulton birthed Steamboat Americana as few places could. The Rookwood Pottery was originally housed in a brick school house east of Litherbury Street on a northwestern portion of today’s CB&RT. Joseph Longworth bought it at a sheriff’s sale in 1880 for his daughter Maria Longworth Nichols to start the pottery business. It is visible in the photo below, an imposing white building with red roof near the lumber yard. View of The Island Queen. Courtesy of Cincinnati Public Library (Postcard Collection). Note the lumber yards onsite. The Rookwood name refers to the crow-like birds (rooks) that lived at Longworth’s Grandin Road estate in Walnut Hills. Rookwood Pottery made a wide range of shapes from Ohio River clay, the first having been decorated by Maria herself and sold to Tiffany’s. Rookwood won many international awards in the late 19th and early 20th Centuries. It was one of the first businesses to be owned and operated by a woman; it moved to Mt. Adams in 1891 after outgrowing the schoolhouse. The Rookwood Overpass still functions for both The Fulton Railroad Co., and SORTA (The Southern Ohio Regional Transit Authority). The overpass was built to bring rail traffic across Eastern in the early 1900’s. The train lines serve a variety of uses and BBQ fans can catch a train ride from Madisonville to the Boathouse today. 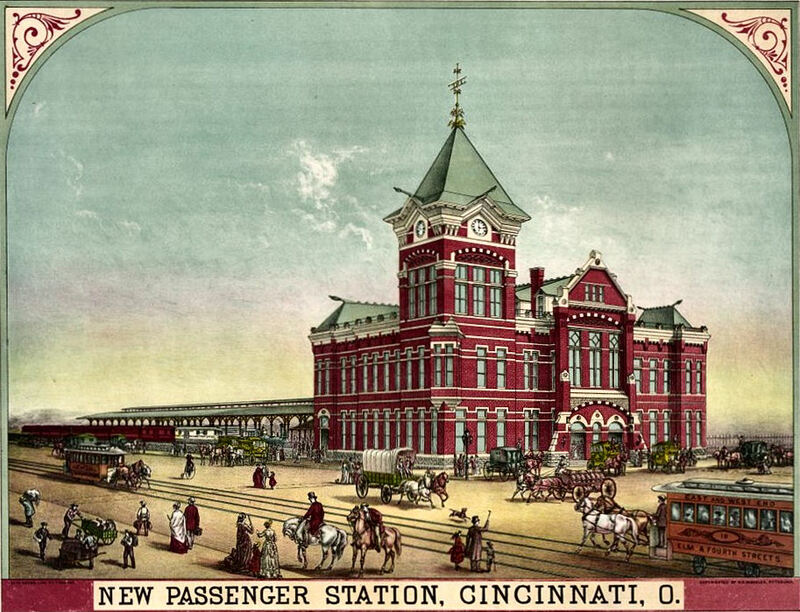 Cincinnati’s Penn Station in 1880. at Pearl and Butler (Kilgour at Pete Rose Way). The Pittsburgh, Cincinnati, Chicago and St. Louis rail yards appear on the 1891 map between today’s Riverside Drive and the river on the western side of today’s CB&RT property and Friendship Park, then Penn Station. The rail and barge uses have dominated the area ever since, as the East End became a transit corridor with a combination of residential and industrial uses. This concluded an era when Cincinnati just may have been “the world’s most interesting city.” A town so vexing that its boats plied the waterways on several continents, and its arts, music, and beer brewing knew few bounds. In this timeframe, Cincinnati witnessed the birth of professional baseball as New Orleans imported its wrought iron and Paris its champagne.